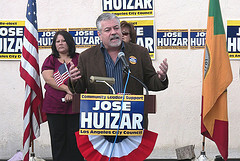 Downtown Russell Brown stumping for Jose Huizar. Our fateful faithful correspondent recently completed a magnanimously opalesque tour de farce of historicalisticism concerning a wildly successful 2010 plot by a bunch of bitchy BIDsies along with then-councildude Eric Garcetti, le petit ami chéri de toutes les dames mignonnes des BIDs, to ruthlessly destroy a perfectly reasonable proposal from the City Ethics Commission to make it easier to figure out who’s supposed to register as a lobbyist. Well, as part of his research he ended up transcribing not just the nonsense spewed by best-BIDdie-buddies Garcetti and Morrison, but a bunch of other tangential nonsense as well. Some of it’s fascinating in its own right, and we’re planning to write about it from time to time, starting this evening with a pluperfect portion of paranoia from Downtown L.A.’s own pallidly prophetic Russ Brown himself! Historically-minded observers of the Downtown Los Angeles politico-sociologico-ethnomethodologico-cultural scene will remember Mr. Brown as the erstwhile boss-boy of the Historic Downtown BID, ignominiously forced out of his BIDship by the Board for reasons that surely aren’t being stated, and then ignominiously reinstalled two weeks later when Jose Huizar pitched a fit for reasons that surely also aren’t being stated and then… well, you get the idea. These days he’s doing something with neighborhood councils and remains the subject of artful advocacy blog Step Down Russ Brown which, though currently dormant, may any day rise, like Lazarus, from its pallet to scourge yet again the corridors and crannies of Downtown zillionaire-dom. Enough of that, though. Turn the page for the quotes!